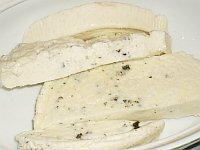 Haloumi cheese is an easy cheese to make, and can add variety and interest to cooked dishes and salads. Keep reading to learn more about how to make and use this Greek original. Haloumi slices can be fried or grilled. Its heat resistant property comes from the fact that the fresh curds are boiled in whey and then placed in a brine solution for storage. The brine solution also makes this a long-lasting, but naturally salty cheese, and the brine is often rinsed off before the cheese is cooked or eaten. Haloumi is made with only two ingredients: milk and rennet. 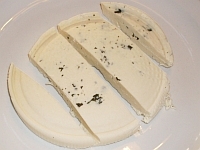 The lack of cultures causes this cheese to be rather bland, and mint leaves are traditionally used to impart flavor to it. Some modern recipes also call for the addition of a mesophilic starter culture to add more flavor. Multiply the amount of time until surface gelling by 2, and wait that much longer before cutting the curd into 2" pieces with a long knife. 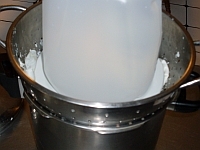 For example, if it was 10 minutes before the surface gelled, wait 20 more minutes to cut the curd — cutting horizontally, vertically and diagonally across the depth of the curd. Let the curd pieces rest for about 10 minutes, then cut them into smaller, 1/2" pieces (a wire whisk works well for this). Let the smaller pieces rest for 10 more minutes. Pour the curds into a cheesecloth-lined colander placed over a pot (you'll be using this pot of whey later), and let drain for several hours until no whey is left standing with the curds. At this point, you can optionally add about 1/2 tsp. chopped mint into the curds, or wait and place mint inside the folded pieces of cheese at the end of the process. 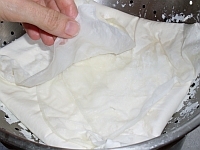 Fold the cheesecloth over the curds and press with your hands to remove more whey and to fuse the curds together. 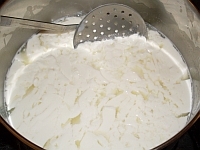 If the curds are still very loose and moist, place a weight on top (a gallon of water works fine), and continue to let drain. When the curds are dry enough to stick together well, cut them into approximately 2" wide strips. 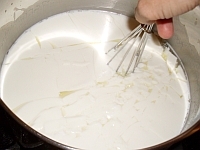 Bring the pot of drained whey almost to a boil (around 195°F), and drop in the cheese strips. 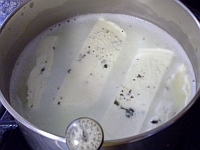 To store the haloumi, you can make a brine solution of 1/2 cup salt dissolved in 1 quart water. It's traditional to fold the cheese slices in half, making a "U" shape (optionally with mint leaves inside the folded portion), before storing in the brine. The brine will keep your haloumi good for several months, and the flavor will increase with storage time. You can grill or fry your haloumi, or use it to top salads and stir-fries. The thick, chewy texture of this cheese makes it a great protein substitute for meat in main dishes. 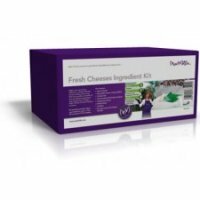 Get all the supplies you need to make up to 33 pounds of fresh cheeses, including feta, halloumi, cream cheese, cottage cheese and more, in the Fresh Cheese Kit from our affiliate, Cultures for Health. Articles are updated frequently, so check back here for any new ideas for haloumi cheese!